Comedian Louis C.K. closed his 2013 comedy special Oh My God with a hilarious (albeit crude) bit called, “Of course . . . but maybe.” I thought it would be fun to apply the same thinking to personal finance and some of the situations we run into every day. 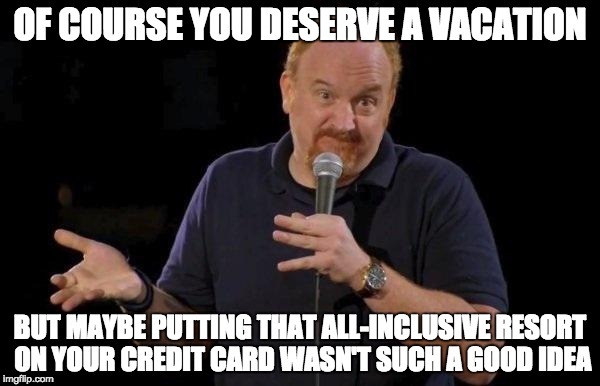 Of course you deserve a vacation. You worked hard all year, and sure, while you didn’t make much progress paying off your credit card debt, and your New Year’s resolution to reign-in the impulse shopping was busted by February, a week spent soaking up the tropical sun will re-charge your batteries and give you a fresh start on your financial goals. Of course mutual funds offer an easy way for investors to put their hard-earned savings into a diversified basket of stocks and bonds. You can start investing with as little as $25 per month and build up your portfolio without any transaction costs. But maybe you didn’t notice the annual management expense ratio eating into your returns. Maybe, as Vanguard founder Jack Bogle estimates, the 2.5 percent a year in fees over a typical investor’s lifetime means that an astounding 80% of compounding returns ends up in the hands of the manager, not the investor. And maybe your financial advisor is really a salesperson in disguise, recommending funds that may not be in your best interest. Of course you should buy insurance to protect your loved ones in case something terrible should happen to you. Of course you want to provide for your dependents in case you die or become disabled. But maybe asking your insurance broker if you need insurance is like asking your barber if you need a haircut. Maybe if you are single and have no dependents you might not need life insurance. Maybe a simple term life insurance policy that pays off your debts and provides 5-10 years of income for your spouse and children is all the insurance you need. And maybe mortgage life insurance and balance protection insurance really just protect the bank at your expense. Of course you don’t need a budget. You have a great handle on your finances. You pay yourself first. You’re debt-free. You live within your means. But maybe if you spent three months tracking your spending you’d discover several hundred dollars a month worth of unaccounted for expenses in categories such as dining out, gifts, and “miscellaneous”. Of course you should aspire to own your own home one day. After all, you’re just throwing your money away on rent every month. Why not build up some equity of your own? And with house prices continuing to rise, of course it’s better to get into the market now before you’re priced out forever. But maybe home ownership isn’t the panacea it’s made out to be. Maybe new expenses, such as property taxes, home maintenance, and lawn care cost more than you thought. A big-fat mortgage means you can’t afford to save for retirement, or even the odd dinner out. It turns out that maybe renting was a lot cheaper and gave you the freedom to pursue and achieve your other financial goals. Readers: Do you have one to share? Give us your best personal finance take on, “of course … but maybe” in the comment section below. @Beth – I tried to use the most common situations I could think of that apply to people across the board. I’m sure we’re all guilty of any one of these at some point in our lives. Right after home ownership I would add car ownership. Many people do not need two+ cars. @Steve – Cars is a good one, too. Of course you need two vehicles. How else are you going to get to work, pick up groceries, and take junior to swim lessons? But maybe if you didn’t live 40 miles from work you could find easier access to public transit, or walk, or use a bike to get around. Of course you need to order that appetizer, steak & ribs dinner with a bottle of wine at that nice new restaurant. But, maybe you would enjoy yourself and save a lot picking up a good cut of steak at a local butcher, buy a bottle of wine yourself and enjoy it while you light up the BBQ with some friends! @Dividend Wisp – Ha! That’s great, and so true. The bottle of wine kills me because I know the mark-up on wine at a restaurant is like 3-4 times cost. Brutally expensive. Thanks for sharing. New car ownership…of course you need a new car, and leased at that! Of course your kids deserve the absolute best and they shouldn’t have to go through the stress and turmoil you went through as you worked 3 jobs to get yourself through university… But maybe you learned a lot about hard work and dedication in those years that your kids may never get the chance to learn, and maybe, just maybe working as a greeter at WalMart until your 85 as a result of the “real education” your kids have now missed out on, just isn’t going to be all that awesome. There has to be a middle-ground between graduating with a crushing student debt load and getting an entitled free ride. Yeah and having children is a must have good idea but can you afford more than you can afford to feed and healthy and educated , happy is not a problem all they need is to be loved. Of course you should aim to make the smartest investment choices possible, after all, you only get one investment lifetime. But maybe that hot stock tip from your uncle and that hedge fund with a fancy name charging you 2 and 20 aren’t as smart as they sound. Maybe trying too hard to be a smart investor is actually hurting you. And maybe the smartest thing you can do is build a boring, low-cost, well diversified portfolio and forget about it…for a year at a time. @Benjamin – I love it! It’s unfortunate that when it comes to investing we see simple and boring as unsophisticated strategies for beginners. Meanwhile we feel the need to chase exotic strategies that promise excess returns, which usually means high fees and disappointed investors. I think its called “get a job, have 6 roommates, save like crazy” Then go to school a few years later.. It is possible to not have to borrow much. We just have high expectations of what we’re entitled to. Chances of success are much better if you start later in life and have a clear direction and maturity on your side. I agree with you on the importance of a gap year (or two). It’s not that the college lifestyle isn’t fun when you’re 18 or 19, but it doesn’t usually mix well with studying and finding your career path. Yes!!! It’s the tough truth…great examples! “…2.5 percent a year in fees over a typical investor’s lifetime means that an astounding 80% of compounding returns ends up in the hands of the manager, not the investor.” That IS astounding. That people still buy such funds illustrates the dire need for more financial education! This speaks to our instant-gratification, immediate-action society. We’re really good at considering the here and now, but struggle with the details or looking at the future consequences. Perhaps this should be put in every single freshman’s orientation packet. Now that would be fun. Love your approach to his “But maybe…” jokes. 🙂 All great aspects and imporant to realize.